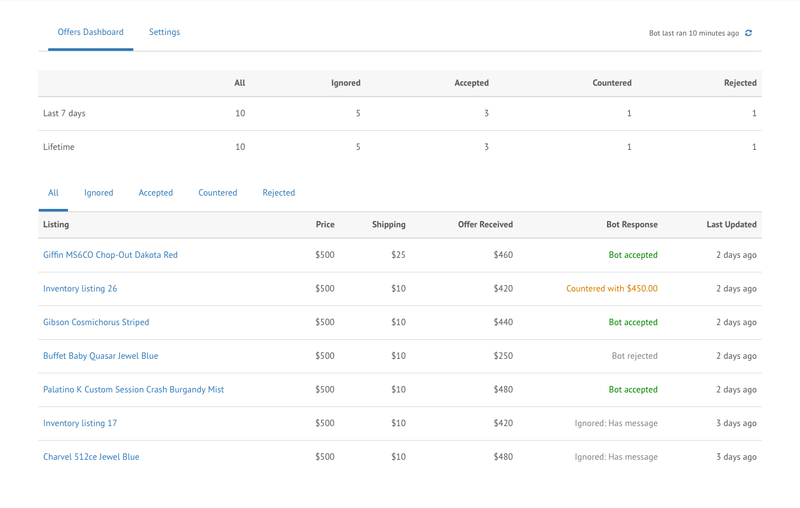 Use the Reverb Offer Bot to automatically accept, counter, and rejects offers within specific parameters. Set a minimum and maximum listing price for the Offer Bot to respond to. Set reject and accept ranges based on the listing price. Offers between your reject and accept range will be countered with your accept amount. Q: Which types of offers does the Offer Bot act on? A: The Offer Bot will only auto-respond to the first offer received from a buyer on one of your listings. It will not respond if a buyer counters one of your offers or to offers that include a message. Q: Why not respond to offers that include a message from the buyer? 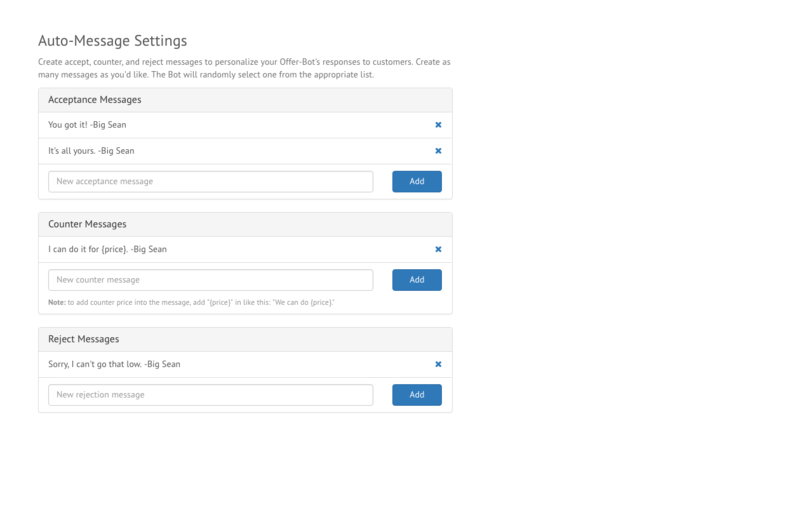 A: The Offer Bot does not respond when a customer sends you a message with their offer because the customer may be asking a question. Q: How does the Offer Bot respond to customers outside of my country? A: If you have a shipping rate set for the customer’s location, the Offer Bot will use the appropriate shipping price for their location and use your settings to accept, counter, or reject the offer. If we do not know the customer’s location or you do not have a shipping rate set for their location, the Offer Bot does not respond because it does not know the appropriate shipping price to use in a response. You will need to respond to these offers on Reverb.com. Q: How does the 2% Haggle Protection work? A: Haggle protection, when turned on, prevents you from haggling over small amounts when you receive an offer that is close to your accept amount. For example, if you are selling a $100 listing and have an accept percentage that would accept at 90% (i.e. 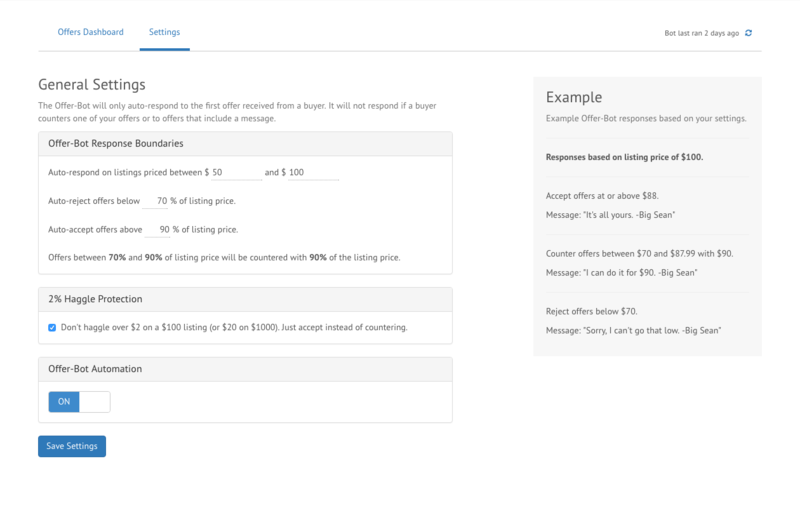 $90), you might not want your Offer Bot to counter an offer of $88 or $89 with $90. Turning haggle protection on allows you to accept offers between $88 and $90, instead of countering them. Haggle protection uses 2% of your listing price to determine when an offer is close enough to your accept ratio to auto-accept. Q: Will the Offer ­Bot respond to counter offers I've received as a buyer? A: No. The Offer­ Bot only responds to offers on listings you're selling.